Sorry to steal Jon Oliver’s opening line but it’s International Beer Day and we’re psyched! Also, have you seen the episode where he has to drink a bud light lime? Anyway, back to the holiday talk. Founded in 2007 in Santa Cruz, California by Jesse Avshalomov. 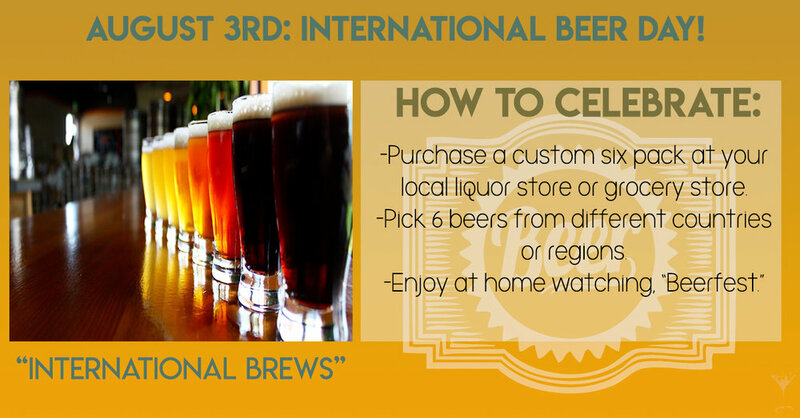 International Beer Day is a celebration on the first Friday of every August. It started as a small thing in a local bar and is now celebrated the world over. That’s the power that beer has, yay beer! We’re not kidding either, we’re talking 207 cities, 80 countries, and 6 continents. Most unlike some of the other holidays we’ve covered, beer day is so serious it even has almost a mission statement. Here’s why we said rules real ominously before. Participants are encouraged to give one another the 'gift of beer' by buying each other drinks and to express gratitude to bartenders. Which is awesome. They deserve lots of gratitude for sure. Popular forms of International Beer Day Events include Tapping of new or rare beers with other beer devotees, all-day happy hours, beer flights, trivia nights, binge drinking and other games. When we say games, you say beer pong! More Guinness beer is drunk in Nigeria than in Ireland. Look it up. On this amazing day celebrating a love of beer that took flight from a local bar to a worldwide stage, perhaps it’s a great time to get a flight of some world beers. If you just want a ‘sixer of your old faithful brand that’s cool too.